Here for the first time, a complete taxonomy of Ted Talks. Adam Romer discusses his life as a digital nomad, traveling around while still working his startup. Shades of Sheila and Evo! 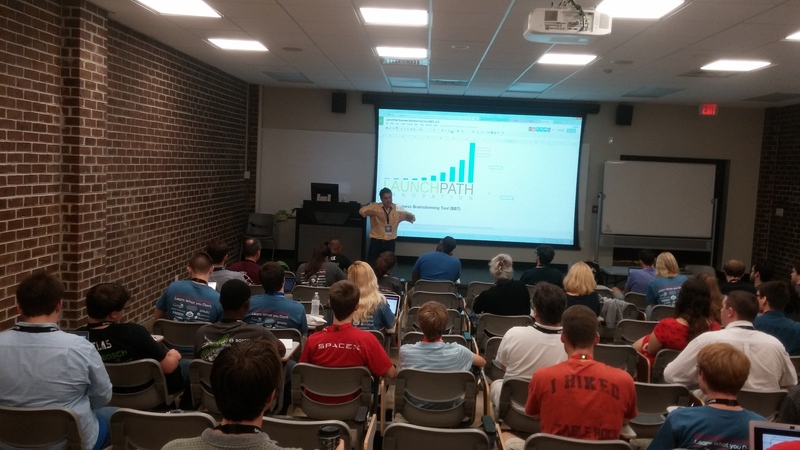 Taken at BarCamp CHS 7, 2015-11-07. Gray Sommerville teaches on how to create a startup that will get a good valuation. Taken at BarCamp CHS 7, 2015-11-07. I will be at BarCampCHS 7 this Saturday. Although I am not making an explicit sales job of it, anyone who wants to talk about ServiceNow and particularly our independent developer program (for which I am now an evangelist) is welcome to seek me out. I’ll be wearing a company logo shirt and will talk about the company and the program at any length you wish. See you there, fellow makers, geeks and nerds! Also, I will have Subproto collateral as well, if you want to talk about Myrtle Beach’s hackerspace. Come by if you swing up our way! I saw this statement in a post, and I can guarantee you that for whatever person you substitute, I have not. TED is yet another thing I am supposed to love without question but is an anti-brand to me. I can’t get excited about forced profundity or delighted that rich technocrats throw the commoners a few crumbs by letting us see the videos of these stilted, affected performances from their parties for themselves. This is not unrelated to the notion that we are supposed to love high production value podcasts but with shows like This American Life, the production itself is what makes it unpalatable to me. I’ve had enough artifice and slickness, now I’m searching for the visceral, the joyful and the authentic. Here’s a video that is circulating the BarCampCHS circuit. It is the one that Geoff Marshall put together from the day. Enjoy! Last Saturday, October 24 2009, was the first ever BarCamp in the state of South Carolina, BarCampCHS. It was held at the Lowcountry Innovation Center which is in a former Navy yard. The Charleston contingent has been highly supportive of CREATE South the last few years so it only seemed reasonable to support them in this effort. I got up at 5 AM and drove up first thing in the morning. It was pretty uneventful as a drive up until the point I hit the roadblock with the cop blocking the road that both my GPS and a biiiig BarCampCHS sign said was the way to the venue. There was a road race coming through and the cop said I could not go that way. “Where are you going?” he asked. I replied “The Lowcountry Innovation Center.” “I don’t know where that is.” I asked him how long before the road reopened, trying to figure out if we are talking minutes or hours. “I don’t know, I can’t tell you” was his response, which I didn’t believe for one second. I’m sure the cop on this Saturday morning knew when he was able to leave this spot and get on with his life. I opted to just drive off, head in the general direction I believed the building to be, and hope that the Garmin Nuvi GPS would send me to the right spot. After about 10 minutes of meandering around North Charleston, I did in fact get to the venue. I got there during the morning breakfast time, and got a chance to chat a bit with friends from the area. I had plenty of time to mingle before the introductory session kicked off at 9 AM. After introductions and some basic housekeeping announcements, the agenda turned to the session pitches. Each person who was interested in presenting gave a 30 second abstract on their session. Theoretically, the sessions would get voted on by the attendees based on how much people wanted to see them. In practice this wasn’t actually necessary because there were more open room slots than session pitches, so everyone that had a session got a room. This is the first BarCamp I had ever attended, and I’ll admit that I’m not a huge fan of this part of the structure. A lot of people seem to love it but I’m not wild about it. It definitely distills the attendees down into a class of rarified geek attendees because I’d imagine for most ordinary people the notion of going to a conference that is getting assembled on the fly is off-putting. I find it a little bit so, and I’m in the choir waiting for the preaching. It worked out fine, as I’m sure it always does. I’d be just as happy if the voting happened exclusively online the week before and it got mostly or completely set the day before so that I could plan out which things to attend and know when I got there, with maybe a room or three devoted to the on-the-fly sessions. It’s just my personal preference. I know that the BarCamp format is very popular and I think most other geeks love the feel of just barely pulling it together. I freely admit this is my personal tic, and that I’m a spazz. Milage varies. As an organizer of a conference myself, I know that it is impossible to predict exactly how things go in practice. One of those things was the placement of the session board and how it affected traffic flow. For 2010 a better spot needs to be found for it. It was at the top of the stairs, and there just wasn’t enough room for many people to jam in and read it at the same time. I’m not sure where it could have gone easily. It made it tricky to figure out where one wanted to go at any given time. I did work out a way to mitigate that some, which I’ll talk about shortly. The 11 AM hour was particularly bad for me, as seven of the nine sessions are ones I would have attended if I could. I went to about half of the XMPP session, put on by a guy from Collecta, and around the halfway point moved over to the Amazon Cloud Computing session. Both were interesting and I could easily have spent the entire time in either or a number of the other sessions. Once we got into the noon hour, it was time for lunch. It was bbq catered by the Barbecue Joint, a restaurant that was near the venue. I had a giant plate of pork, cole slaw and baked beans. I made an effort to sit with people I didn’t already know, but I didn’t talk to them that much. I did soak in the vibe and listen, but I didin’t have much to say and didn’t introduce myself. I spent a fair bit of time talking to Dan Conover about an idea of his that he posted to the Xark weblog that I think should really be its own business. We talked about his life, why he should pursue this idea, how he could do that without starving and all that fun stuff. This was really a long lunch break we had, which allowed for lots of talking to people and meeting new folks. There was an assemblage of people outside the back door to take a group photo. This was one of those moments where the hippie anarchy of self-organization really needed to take a back seat for a minute, with one and only one person in charge. After some milling around, Chrys and a few others snapped the pictures for the official record of the event. I’m pretty sure that in a number of those, I am occluded from view. In pretty much all the ones I looked at, I’m not visible. After the photo shoot, it was on to the afternoon. At 2 PM, I went to the session on Ruby on Rails with git. it turns out that the Ruby on Rails portion was too rudimentary for me, and I ended up getting called out of there anyway. I had a spare projector I had borrowed from my day job, and I was asked if I could set it up in the main room for Team 342 to use during their robot demonstration. I went out to my car to get it, set it up, and the damn thing never worked. After some troubleshooting, I realized that the projector I took of two choices completely at random had a burned out bulb. Unfortunately, that pretty much ate a lot of the 2 PM hour for me. I did go over and walk through the art area, which I liked a lot. I wanted to have something like this last year at CREATE South and I hope to have it more fully fleshed out this year. My goal is for anyone that comes to the conference with something to sell has a community area where they can make that happen. That’s very much like how the art room worked at BarCampCHS and I hope to steal from them what worked. At 3 PM, I went into the big room for the Team 342 robot presentation. They talked about how the program worked, how they got students involved from college and high school, about the actual bulding of the robot and such. I’ll have to admit that as neat as the robot was, I was more interested in the team, the team dynamics, and how they were organized. I found a lot of that fascinating and interesting for what lessons can be abstracted out to serve as a template. I’m interested in getting involved in helping to create the next generation of geeks in the Grand Strand so I was happy to hear those stories. The presentation ended around 3:30 after which people could fool around and drive the robot. After watching a few of the early amateur attempts, I got the hell out of dodge, spurred on by my own self-preservation gene. I had a few more conversations and met a few more people before the beginning of the 4 PM sessions. At 4 PM, I went to Chrys Rynearson’s session on Drupal. I’ll admit that I knew practically nothing about it before the session began. I got very interested really quickly and decided that this might be good for the CREATE South website so I installed it in our hosting account as I sat there and began working along with Chrys as he showed parts of the administration GUI. I’m far from done with it, but what I have started is here. Chrys is a Drupal wizard who works with it every day at his job, I’m a duffer. His session made me believe that it might well be the best tool for us, though, and made me want to learn more about it. What can be better than that? This sort of thing is why I came, and honestly by itself this session would have made the drive worth it. After this session, I made my goodbyes and hit the road. The 5 PM hour included the popular “BaconCamp” session but I wasn’t on fire for it. One nice bonus was that they had a stack of books to give away to attendees. You marked three items you were most interested in winning, and they did drawings to give them out. I won one of them, a copy of Microformats Made Simple. Interestingly enough, I had multiple conversations during the day that microformats were applicable to, so I’m looking forward to reading this book. So overall, I had an absolutely great time. It was fantastic to feel the energy and to see people excited, and excited about how they could learn things to allow them to do good and interesting work. I’m all for anything that raises the tech profile of the South Carolina coast. I think the event generally ran very smoothly with the hiccups being minor in the big scheme of things. The only issues I had were the placement of the session board and my structural qualms with the BarCamp format itself, which is no knock on BarCampCHS. I like the idea of BarCampCHS being a regular annual event in the fall, alternating with CREATE South in Myrtle Beach in the spring. Both events have different feels and different scopes and the presence and possibilities of both make the pair stronger. It was a great day, with great people, great friends, great food and as such, I had a great time. Let’s take what we learned, get smarter and tougher and more bad-assed, build some stuff and teach even more next year! Myrtle Beach, SC: At the Baker’s Dog on June 13th will be Pet Portrait Day. I’d like to take Koga there. The whole affair is part of a professional photographer going on tour to raise awareness for animal shelters. Sign me up. Durham, NC: Wordcamp RDU will be that day. Note that if you go to the front page you’ll see Wayne Sutton’s smiling face. I first met him at Converge South 2007 when we walked together from the conference building to the parking lot. Since then he has really become a North Carolina new media superstar. The conference looks really interesting and worth pursuing if you are anywhere close and anywhere involved in WordPress. 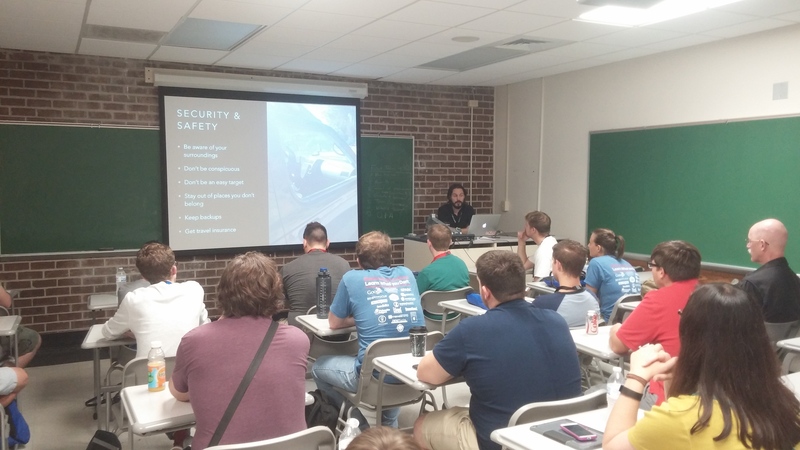 Clemson, SC: On June 13th, the Southeast Linux Fest will be held on Clemson campus. Fyers for this event are hanging in my workplace and I’ve seen some of the Charleston people talking about going to this event. The speaking schedule looks pretty interesting to me, but I really don’t think I can swing attending. I’m glad it is happening in my part of the country though. Atlanta, GA: The Susi French Connection is the side project of the Gentle Readers and a band I really love seeing. On June 13 they will be playing an early and late show at Eddie’s Attic in Decatur. We went to Atlanta last fall specifically to see them when the Gentle Readers were reforming to play as the opening act. This time Herman Put Down the Gun is opening, but I’m sure the show will rock it out. As they say in their web page “If you don’t have a superlative time at a Susi French show, you must be an evildoer.” Check it out and tell them I sent you. There might even be more events that I could drive to and would attend. If I find more, I’ll update this post and put them in. Big day, no? I’m freaked out by how fast the CREATE South conference weekend is coming upon us. April 19th approaches at a startling rate. Over on the CREATE South blog I announce that Ed Cone is our keynote speaker! I’m delighted by this because in several ways Ed was an inspiration for us to have this conference in the first place. We still need to get the word out into the constituencies that could benefit most by this conference. Tell your offline, non-blogging friends about it. If they are within driving distance of Myrtle Beach, they should just come on out and spend the day with us. If you have people you’d like to get blogging but don’t feel like teaching them, send them our way. We’ll teach them, that’s what we do. We’re still looking for someone to do a session on how to use new media in a church setting. If you want to do that or know of someone that could, drop me an email. If you or your company are interested in sponsoring the conference, drop me an email. Tonight I hope to flesh out the programming page, send out tons of emails inviting people and generally doing the busy work of making such a thing happen. Chip in a little bit and tell a friend, blog about it, etc. Help me out, blogosphere! I really need it.